Acho que nunca tinha celebrado o Halloween a sério antes de me mudar para Londres. Acho que foi das melhores noites que tive por terras londrinas e estou mesmo entusiasmada pela festa de logo. Muita gente mascarada a rigor, crianças na rua a fazer o “doce ou travessura?”, pessoas a pedir para nos tirarem fotos, e uma festa com direito a hambúrguer às 4 da manhã! Estas fotos são do ano passado. Este ano, o disfarce vai ser o mesmo – uma caveira mexicana. Mas de certeza que o resultado final será diferente. Bem, o S. agora será um “Señor Delgado” com barba e eu serei “La Señorita Dolores” com um anel de noivado a sério! Já fui comprar o kit essencial para fazer a caveira mexicana e vou tentar fazer um passo-a-passo para vos mostrar. Acompanhem-me na página do Facebook para verem o resultado final deste ano! The first time I really celebrated the Halloween was last year, here in London. I think it was the best night out that I’ve had in London and I’m really excited for the tonight’s party. Lot’s of people wearing costumes, children on the street doing “trick or treat?”, people asking to take photos with us, and a party with a burger meal at 4am! These pictures are from last year. 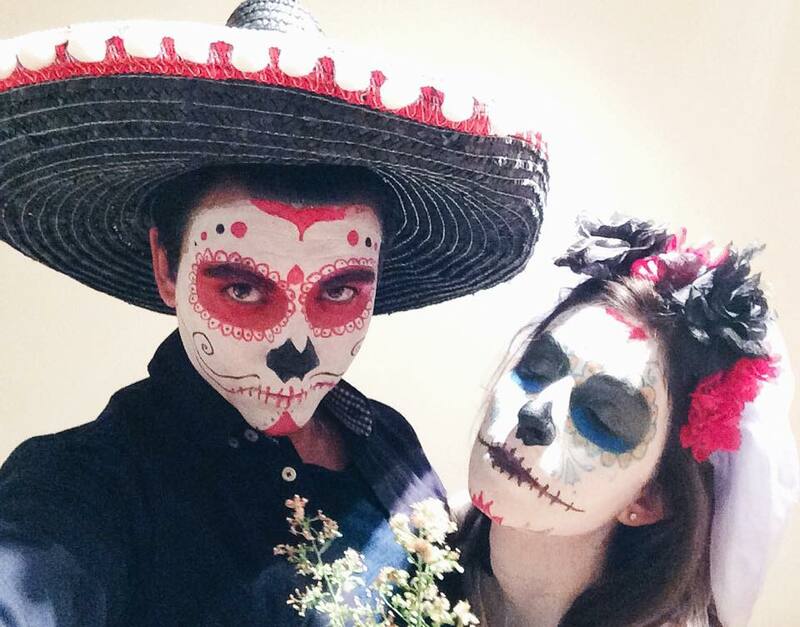 This year, the outfit will be the same as last year – a Mexican Sugar Skull. But certainly the final result will be different. Well, S. will now be a “Señor Delgado” with beard and I will be “La Señorita Dolores” with a real engagement ring! I bought the essential kit to make a Mexican Skull and I will try to make a step-by-step for you. Follow me on Facebook to see this year’s Mexican Sugar Skull! You must be <a href="https://ararapintada.com/wp-login.php?redirect_to=https%3A%2F%2Fararapintada.com%2F2015%2F10%2Fmexican-sugar-skull-halloween-makeup%2F">logged in</a> to post a comment.